Presented by Fox Tango international. 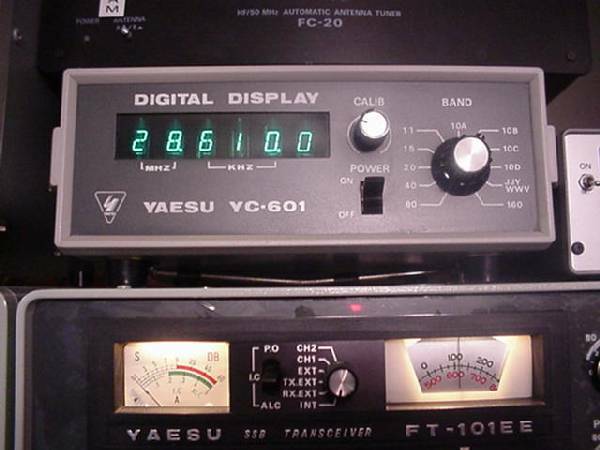 The Yaesu YC-601 and YC-601B digital display station accessories will display actual transmit and receive frequencies. The original YC-601 uses six bright, green colored digital display tubes, while the later model the YC-601B uses six bright, red LED's. The YC-601B also has the option to be used as a frequency counter in the range of 100 Hz to 35 Mhz with an accuracy of 20 ppm. All amateur bands are switched selected for complete frequency readout with 100Hz accuracy by a diode matrix circuit. 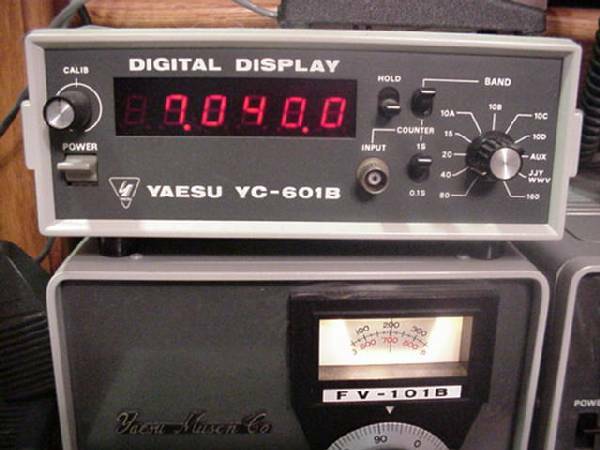 The YC-601 provides and out of band warning system by automatic flickering of the display tubes when the VFO frequency is outside of its 500 Khz coverage, the YC-601B did not have this feature. Both units use a built in internal power supply and connection cables came supplied with the unit. All wiring interconnections, installation and operation of the unit can be down loaded in the PDF manuals above. While both units may appear to be similar to the casual user, there is a big difference in the internal circuitry of the two display units. Both the YC-601 and the YC-601B read the VFO frequency (8700 to 9200 Khz). 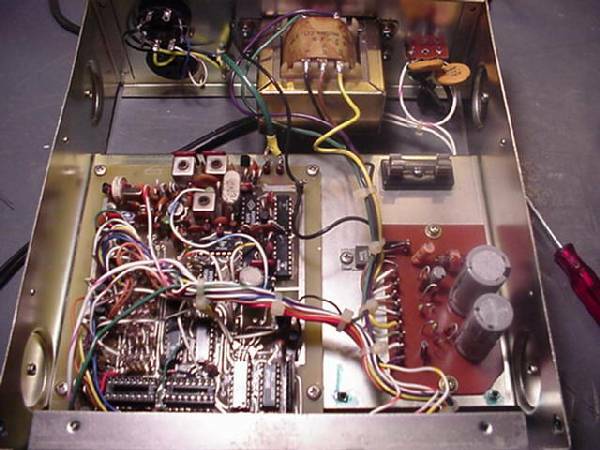 The YC-601 incoming frequency enters an RF amplifier and applies the signal to a mixer circuit. The heterodyne oscillator running at 11.1 MHz is tuned to the second harmonic of 22.2 Mhz is applied to this same mixer, producing a 13.0 to 13.5 Mhz signal at the mixer's output. The frequency of an 11.1 Mhz crystal / heterodyne oscillator is shifted +/- 4 Khz by varying oscillator using a voltage that can be varied with the CALIB potentiometer on the front panel. Beating this new signal against a crystal controlled clock oscillator of 1.31072 Mhz the signal is again converted to a BCD output and applied to the display drivers IC's and finally the display tubes in the case of the YC-601 display. The most commonly seen problem in the YC-601 appears to be a dead counter that will not count the incoming frequency or the display will not calibrate. 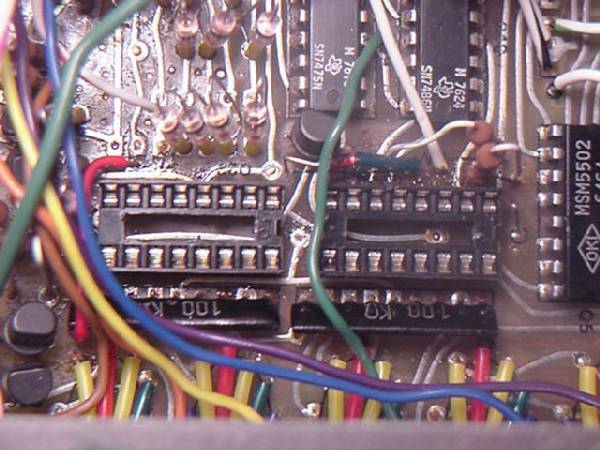 If you own a YC-601 digital display and it will not calibrate properly from the front panel calibration control you may have a bad 11.1 Mhz heterodyne oscillator crystal that is either dead or has gone out of tolerance due to it's age of the crystal. I have several of these gems in my shack, having just picked up third YC-601 it came with a problem where as it would not calibrate with the radio when using the front panel CALIB control when turned completely to the right or left. There was an attempt from the previous owner to jury rig the heterodyne oscillator by adding some value capacitors into the 11.1 Mhz oscillator in an attempt to trick the display into reading the right frequency. This worked somewhat but strangely enough you could not get enough range out of the calibration control to enable both the Upper and Lower side bands with a correct display reading. I could get it to calibrate on one side band, but when shifting to the opposite side band we have to make a 3 Kc shift and the counter would not calibrate to the opposite side band. So the jury rig capacitors across the crystal didn't work and adequate repairs had to be made. In this case the old 11.1 Mhz crystal was doubling and still giving me a 22 Mhz mixing frequency to work with but it was too far out of tolerance to allow the display to calibrate, and the internal mixer would not work within specifications. An interesting thing to note is the differences between a YC-601 and the YC-601B. While both units appear to look some what the same from that old familiar front panel, they are really two different animals. They both use a 1.31072 Mhz clock oscillator frequency (Still available from Yaesu USA @ $26 USD P/n H0100052) While both the YC-601 and YC-601B both use a 22.2 Mhz frequency in the mixer stages, other then that the two units are completely different when it comes to the input stages and mixing stages. 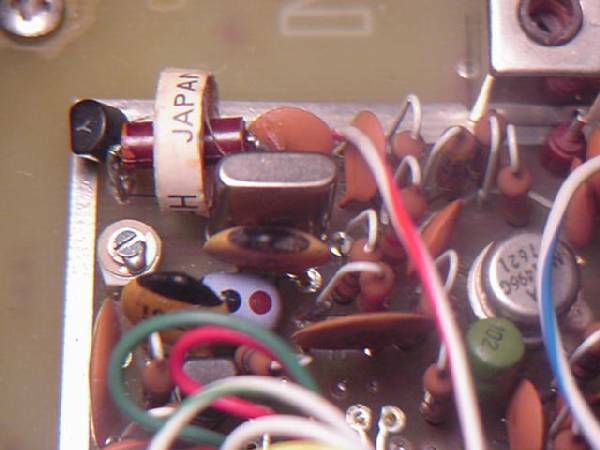 The YC-601B is also capable of being used as a frequency counter from 100 Hz to 35 Mhz, overall the YC-601B is a much improved design over that of the original YC-601. However either way you look at it, both the YC-601 and YC-601B are both getting old by comparisons with technology on today's amateur market. However if you're like me and you enjoy using and restoring the older equipment then it may be time to change some of those crystals to keep your old display unit up and running with tip-top performance. (Digitron Yaesu's name) VFD display tube or display driver I.C. In the photo above you see the result of a partially bad display driver I.C. uPB-249D in the YC-601 display. This display is actually showing 3.000 Mhz and it is assumed the lower right hand corner of the numeral three is defective. However that was not the case. The display driver was overheating and only partially working. They YC-601 uses three display driver IC circuits. In this case the defective display I.C. driver (Type uPB249D) was connected to the digit right after the decimal point. I removed both display driver I.C. chips (Q11 and Q12) and replaced both the I.C. with 16 Pin low profile sockets. Now by moving the defective I.C. from it's original position into the other socket, it was easily confirmed the problem moved with the chip telling me the display tube itself was still good. It's highly recommend when servicing your display, you should use I.C. sockets to save on wear and tear of your circuit board should you ever have a need to replace the I.C. in the future, or if for some reason a new I.C. were to be destroyed during servicing. Be forewarned that it is not an easy job removing the chips because the circuit board is a double sided circuit board, so don't necessarily expect to get the old I.C. out in one piece. Have a few spares handy should you find the need to clip the legs of the original driver I.C. chip. The I.C. sockets are well worth the small investment, but far be it can offset the price of the uPB249D display driver as this I.C. can often be as high as $29 or more for a single display driver chip, if you can even find one. In an effort to learn a little more about the NEC driver I.C. chip, I made an inquiry to NEC in Japan looking for a data sheet on the uPB249D driver, NEC Japan wrote back to me "UPB249D was discontinued 13 years ago, and the documents are not published yet. So you cannot get them"
Commonly know as a VFD tube, the YC-601 and the FR-101D digital receiver of the mid 1970s use the NEC LD8062 and Futaba DG10S1 with 13 wires. The VFD was found in some early four function calculators , which may some day provide a source for spare parts for your counter should the supply of LD8062 dry up. 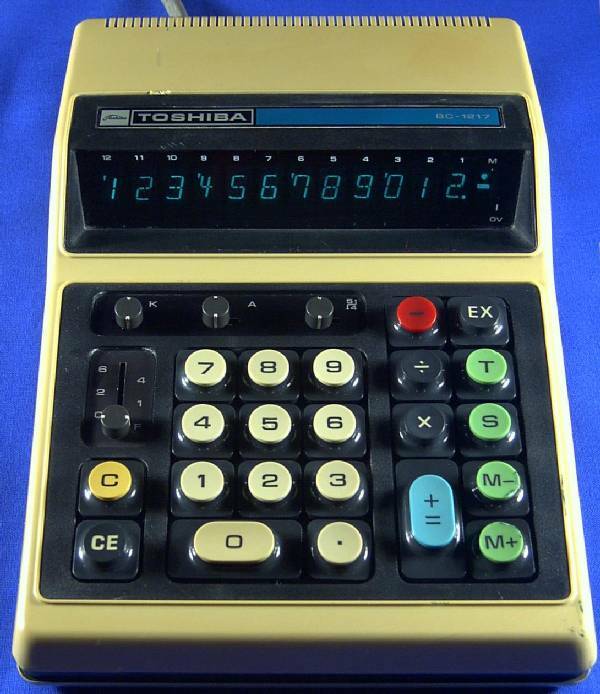 The later YC-601B no longer used the green VFD display, it came equipped with six (RED) 7-segment LED (Light Emitting Diode) display. The Futaba VFD DG10S1, 10 mm high full indicator reading. The DG10S1 is a digital indicating tube with 8 mm high numbers. It can represent the numbers 0 - 9, as well as a comma left above and a decimal point down right. 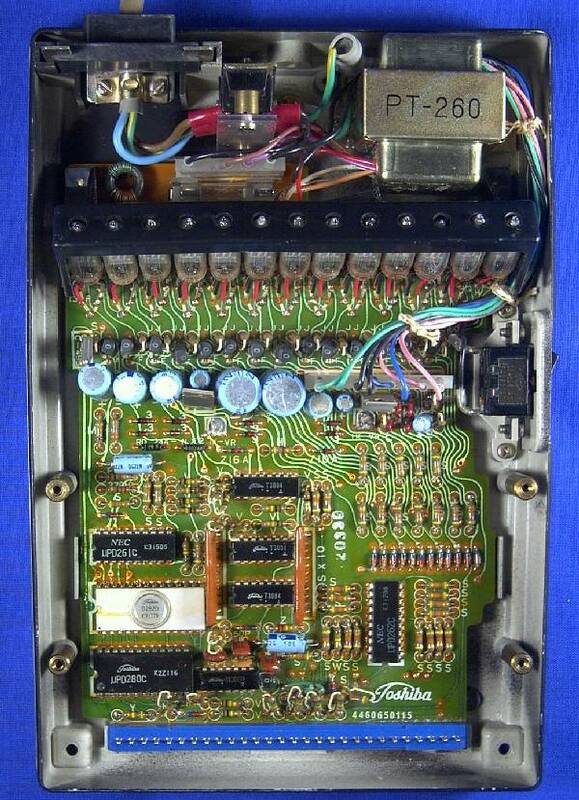 You may find this VFD in the Yaesu FR-101D digital receiver display unit. Lets look at a standard Seven segment LED layout (above right) so we have something to make reference, the goal here is to light up enough segments to display any number from 1 through 9 including the decimal point and comma announcement in the upper left corner of the NEC VFD. the drawing above is not exactly like our NEC / Futaba tube however for this discussion we will consider it to be close enough for referencing our segments as we light each one up individually. 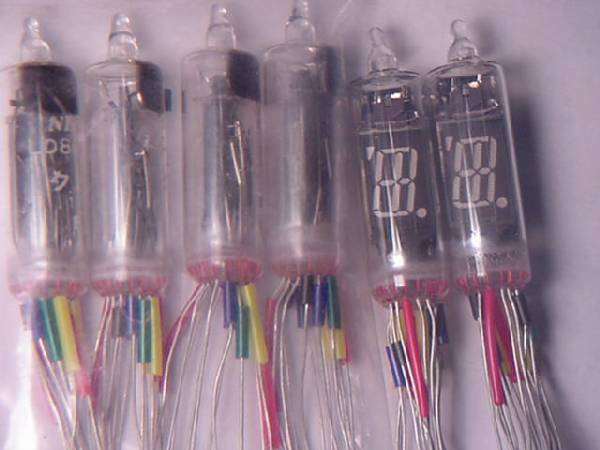 First thing we need to do like any vacuum tube is to light up or filament. 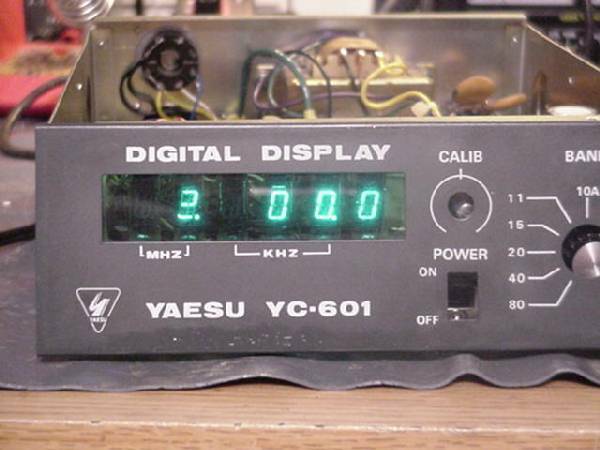 In the YC-601 display as well as the FR-101D digital receiver Yaesu has provided us with a secondary A/C voltage of 1.5 Vac using tap ZERO and 1.5 on the unit transformer we have the AC voltage required to light our filament. In our test project shown here on the work bench we will use a a commonly available 1.5Vdc "D" cell flash light battery which will work just fine for our demonstration. 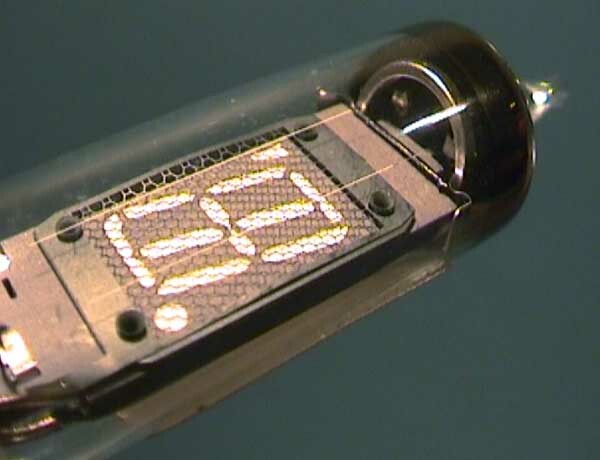 First off and most likely the most difficult part in getting your VFD to light off will be to identify the pins of the display tube, this has been a major challenge for those of us who were not very familiar with this type of technology during the 1970. At this late date and time the VFD tube is a relic of the past never again to be reproduced. So my curiosity in this device is what encouraged me to try doing this on the work bench along with a little encouragement from Fox Tango Member Jim Crayne KE7GUY who also has a love for this old technology. Jim and I got together on the land line putting our heads together to make this thing light up, so we gave it a go and actually had some success. In order to identify Pin #1 on the VFD display, you only need to look as far as this RED plastic covering on the VFD leads as shown in the photos below. Yaesu and other companies apparently used the colors to help identify the leads, but don't jump to the gun as there happens to be more then one red, several yellow, black, green and blue. So don't bank on the colors when it comes to identifying the leads. 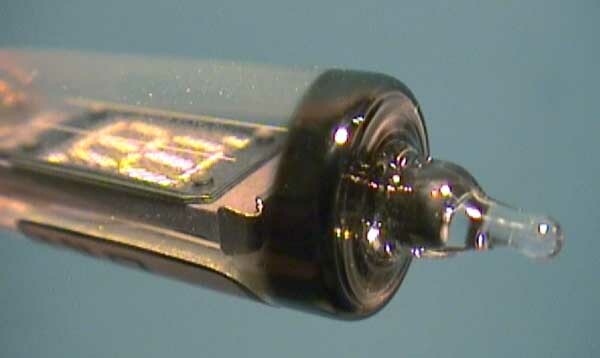 First off the thing to do if you don't have any colored sleeves to make reference, you need to identify the filament it reside on Pin #1 and Pin #4, you could identify this with an ohm meter or a good eyeball under a magnifying lens. Once you have identified the filament you now know where pins number one and pin number four reside. The filament voltage for the NEC and Futaba VFDs that concern us is typically 1.5 volts, as shown below we were able to light up the filament with little or no trouble at all. The difficult part was knowing exactly how much Voltage it would take to fire one of these things up and which pins to apply power. Hardwired on bench showing number three. Shown above a digital #3 above, note pins 7, 6, 13 , 2 and 8 give us a number three. To activate a segment all we need do is to take any one of the listed pins jumper it back to the negative reference point pin number VFD pin three. 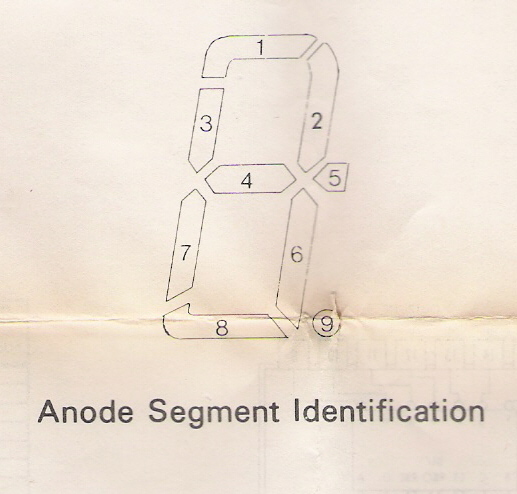 Using approximately (18 ~ 21Vdc) source to the pin to turn on that segment. Now we can make any number we want. I’m going to leave the truth table up to you for setting up the numbers 1 through 9. Using the chart below to show where our filament voltage goes and our Vcc source voltage this should help you should you ever have to trouble shoot a YC-601 or just want to experiment around with a VFD display tube, should you have one to play with. 1.) FILAMENT (1.5V AC or DC Filament and + Positive for 18v source) go to this pin. 3.) REFERENCE point, Negative side of 18vdc source any and all segments you want to light need to be connected back here. If you have any questions, feel free to email me directly. This page is a work in progress, but for now we hope you enjoyed and use our site. We also invite you to join us at Fox Tango International at Yahoo Groups. and we are looking forward to having you join us.